As the holiday season arrives, so do all the festive foods, fun decorations and merry celebrations. While people are busy planning parties with friends and family, many businesses will be putting together holiday festivities of their own. 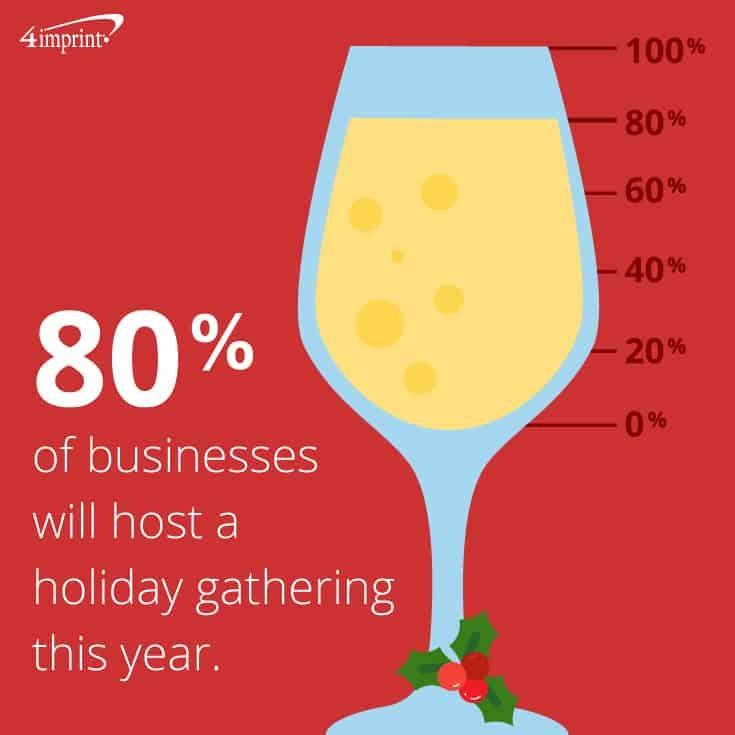 According to a recent 4imprint survey, 80 percent of businesses are planning to host a holiday party in 2018—up from 75 percent just three years ago. 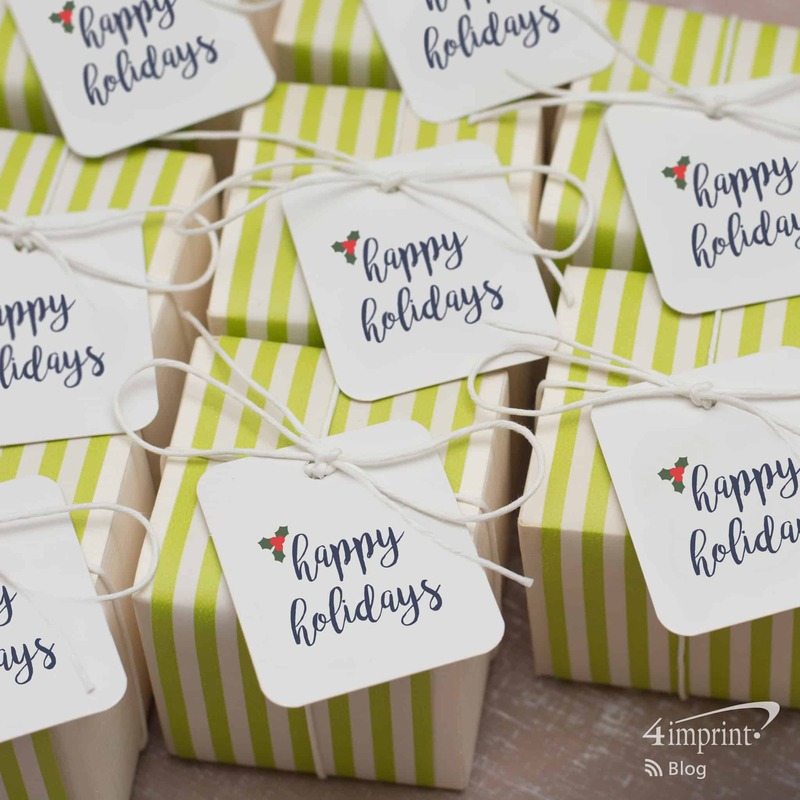 Corporate holiday party favors will be making an appearance at many of those gatherings—1 in 4 businesses use promotional products as party favors. We’ve put together a list of fun branded party favor ideas that will remind partygoers of your gathering for years to come. Ornaments are practical, budget-conscious corporate holiday party favors. 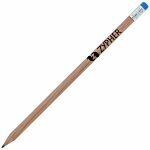 With so many styles and colors to choose from, you’re sure to find one that makes their tree and your brand shine. The Satin Flat Ornament beautifully adorns any tree. Shatterproof construction helps ensure your brand hangs around awhile. The Sun Catcher Ornament – Hanukkah can be hung on a tree or window for a vibrant display. The Seeded Paper Ornament – Star can be used as an ornament, or you can attach it to a gift bag as greeting tag. This gift keeps on giving—plant it in the spring, and it sprouts beautiful wildflowers. The holidays and winter chill go hand in hand. 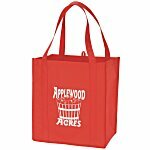 Bring warmth with your brand by giving partygoers a Payson Mini Tote stuffed with ways to help keep the cold at bay. The Individual Hot Chocolate On A Spoon is a decadent way to make a soothing, comforting cup of hot cocoa. The winter chill is no match for this Twill Patch Scarf, while Touch Screen Gloves allow them to use their device without exposing fingers to the cold. On those extra-cold days, the Reusable Hand Warmer – Heart comes to the rescue. They’ll love this item for outdoor sporting events or winter hikes. This year alone, people will take an estimated 1.2 trillion digital photos. Yet, very few of those pictures will be printed. Take candid photos at your holiday gathering. Then print those memories for attendees and place them in a Curved Wood Color Pop Frame or Wood Frame. Or send team members home with a photo of their department. 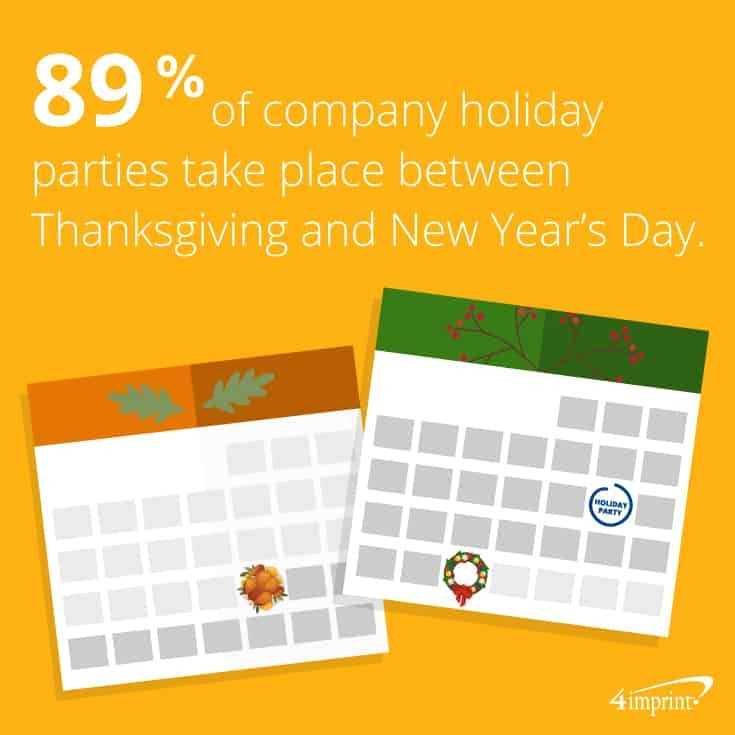 Since 4imprint’s research shows that 89 percent of company holiday parties take place between Thanksgiving and New Year’s Day, there’s a good chance your guests will be partaking in multiple celebrations. They’ll put a Modena Wine Tote, complete with a Vacuum Wine Tumbler or two, to good use. As a bonus, the tumblers can handle a cold or hot beverage, making them as useful for morning coffee, tea or hot chocolate as they are for wine. Slip a Wine Stopper with Opener in the pocket of the tote as the finishing touch to your branded party favor. As people leave your event, send them off with a corporate holiday party favor to remind them of the food, fun and festivity. The happy memories will be the greatest gift of all. 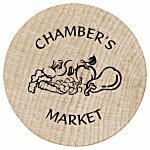 Searching for holiday gift ideas for clients? Looking to thank employees? 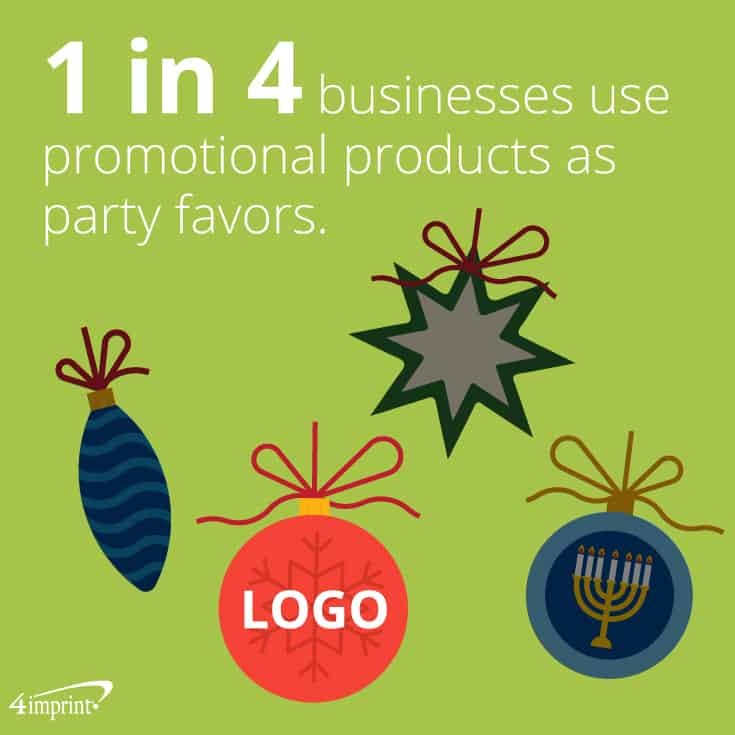 Use these holiday promotional items to mark this jolly time of year.